Are you looking for wonderful goodies for your furry pets? Look any farther because PawPost is here to serve you. All you have to do is to join through subscription. Upon signing up, you should give information about your pet so that you’ll be guided in choosing the right plan appropriate to your pet. Each box is tailored specifically to your pet’s size and needs. Each box contains irresistible treats for your pets such as hand-baked biscuits and other fishy and meaty treats. Customers can ensure that the treats are safe for your pets because those are human-grade, gluten-free and have healthy source of minerals, vitamins, protein and other essential nutrients. Free-grain foods are also included in the box. The foods are all natural and pure making it safe for your dogs. The box also includes toys, supplements as well as hygiene and grooming products. During the entire subscription period, you will receive boxes that contain eco-friendly and natural toys. Most of the products are not available in the local pet shops. The foods and other treats contain all-natural ingredients safe for your pets. 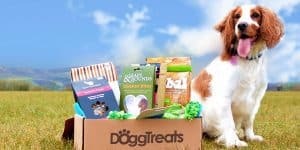 The box also includes selection of products that will make your pet happy. 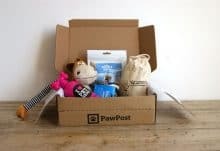 As compared to buying from pet shops, subscribing from PawPost can save you about 40%. You can also take advantage with the free delivery offer. How would you rate PawPost ?